Are you looking for a hard-working pickup truck with a rugged style? Look no further than the 2018 Toyota Tundra at Downeast Toyota. Tailor-made for hard work or play, the Toyota Tundra is a fan favorite that truck owners have come to love. If you have fallen in love with the Toyota Tundra, this 2018 Toyota Tundra SR vs 2018 Toyota Tundra SR5 vs 2018 Toyota Tundra Limited trim level comparison will help you find the right fit at Downeast Toyota. Drivers who choose the 2018 Toyota Tundra will have a choice of five standard trim levels – SR, SR5, Limited, Platinum and 1794 Edition – that can be upgraded with an all-new TRD Sport Package or a TRD Off-Road Package. An updated style provides trim-specific grille designs, LED daytime running lights, chrome exterior accents and more features that add to a bold style that is complemented by power-packed V-8 engines under the hood. What Are the 2018 Toyota Tundra Engine Options and Features? 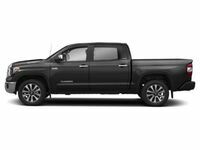 When you opt for the Toyota Tundra, this 2018 Toyota Tundra SR vs 2018 Toyota Tundra SR5 vs 2018 Toyota Tundra Limited comparison will help you find the right fit in the Bangor area. 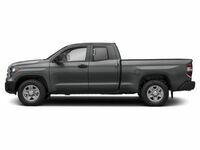 Toyota Tundra pickup trucks are available in Double Cab and CrewMax body styles that can be paired with a 5.5-foot short bed, a 6.5-foot standard bed or an 8.1-foot long bed. Entry-level Toyota Tundra SR variants are not available with the more spacious CrewMax Cab. Under the hood, the 2018 Toyota Tundra can be equipped with a 310-horsepower 4.6-liter i-Force V-8 or a 381-horsepower 5.7-liter i-Force V-8. Toyota Tundra SR and Tundra SR5 entries come standard with the 4.6-liter i-Force V-8 power core that gets paired with a six-speed automatic transmission. Toyota Tundra Limited variants feature a standard 5.7-liter i-Force V-8 engine that is capable of towing up to 10,200 pounds when properly equipped. Drivers who enjoy off-road adventures can add an innovative 4WDemand 4WD system that employs Active Traction Control and an Automatic Limited-Slip Differential. Inside the Tundra SR trim level, you will enjoy an impressive list of standard features that includes a 6.1-inch Toyota Entune™ Audio infotainment system with Bluetooth, Toyota Safety Sense™ technology, a rearview camera, an integrated trailer brake controller and premium fabric upholstery. An upgrade to the Toyota Tundra SR5 will improve your drive with a 7-inch Toyota Entune™ Audio Plus interface that adds access to the Connected Navigation Scout® GPS Link App. Luxurious Toyota Tundra Limited grades feature integrated navigation, a nine-speaker sound system, Entune™ App Suite, leather upholstery, heated front seats, a power rear window and much more. Find the 2018 Toyota Tundra that best fits your lifestyle and budget today at Downeast Toyota!